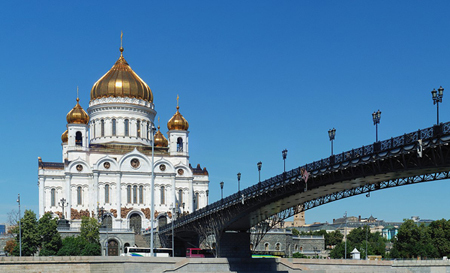 In the late 1990s, I watched the rebuilding of the Cathedral of Christ the Savior in Moscow, replicating the nineteenth-century cathedral that had been dynamited by Stalin in 1931. It can hold an estimated 10,000 worshipers (they stand throughout the long services, for pews are abhorrent to venerable tradition) and is the tallest Orthodox church in the world, with a dome reaching 338 feet. Two hundred churches are planned for Moscow, along with an estimated 1,000 across the nation, replacing and adding to those destroyed in the Communist period, during which priests were crucified on the church doors. These are in the classical Byzantine style, not the modern biscuit boxes and flying saucers that were the bane of the West over the last few decades. In some towns, the local people are taught iconography and mosaic art, so the churches really are the work of their own hands. These days in China, where Christianity is oppressed — not especially for theological reasons, but because it is a threat to the political hegemony of the state — churches are being destroyed. Within the past few months, for example, in Henan Province an Evangelical church was dynamited in Shangqiu, with a blithe ferocity paralleling that of Stalin. In the West, churches are getting demolished for reasons other than political: redundancy, the lack of need for “ethnic” parishes, and the sheer cost of maintenance. Often, people who are much wealthier than their ancestors, who built the churches sacrificially out of their penury, do not contribute enough for maintenance. Between 1995 and the present, the Catholic population in the United States increased from fifty-seven million to over seventy million. New churches are being built in the South and West where populations are growing faster than the decline in other parts of the country. Reverend George Rutler is pastor of the Church of Saint Michael the Archangel in Manhattan. His latest books are He Spoke to Us and The Stories of Hymns.